Sitting in the Gangnam neighborhood in southern Seoul, nothing seems out of the ordinary about the venue -- that is, until you step inside and see walls covered with posters and stickers that go all the way to the ceiling. As you take a seat, it quickly becomes clear why this small restaurant is an unlikely tourist spot for BTS fans from across the world. 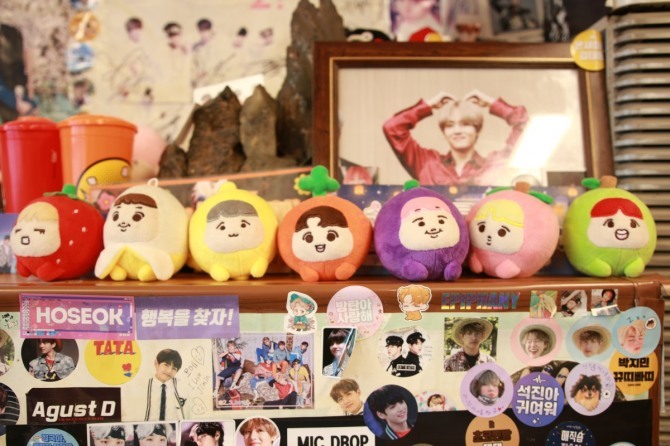 In one corner is a cabinet that has grown into a sizable shrine with BTS stickers all over it, bearing each one of the bandmates’ images. It’s one of the main attractions at the restaurant, and diners could not get enough pictures of it. 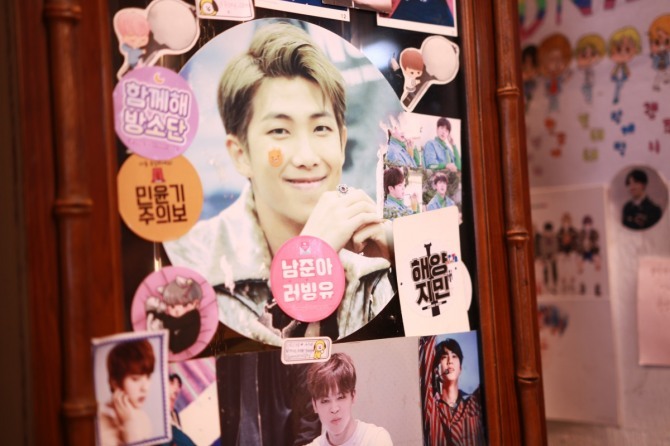 The overwhelming majority of the BTS memorabilia on display there comes from fans, says Kang Sun-ja, who has been running the place for over two decades. She and BTS go all the way back to when the bandmates were training near the venue. Kang says the group that went on to make K-pop history by topping the Billboard albums chart used to eat at her place almost every day for nearly two years. 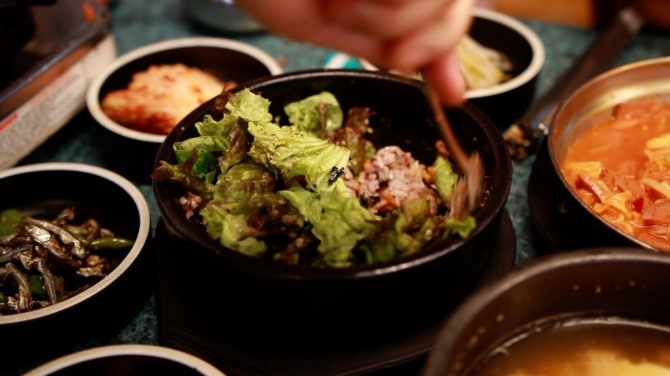 There are four signature dishes available at the restaurant -- bibimbap, spicy pork, sausage stew and kimchi jjim (braised kimchi). Kang said the artists used to have two to three bowls of rice each after heavy training sessions, before they were put on a diet. And as her account of their trainee days might suggest, the restaurant is worth visiting for the food alone. We went there well after lunchtime, yet the place was still busy with diners speaking various languages ranging from Chinese and Japanese to Thai. One table in particular took the spotlight, as that was where the BTS members used to sit and eat. And Yoojung Sikdang doesn’t shy away from taking advantage of its links with the group. The table even has stickers of the bandmates, marking where each musician used to sit, and has understandably become a photo spot with fans taking every opportunity to snap selfies there. Though Kang doesn’t speak any foreign languages, she said she has been able to connect with the Army through their mutual love and support for BTS. 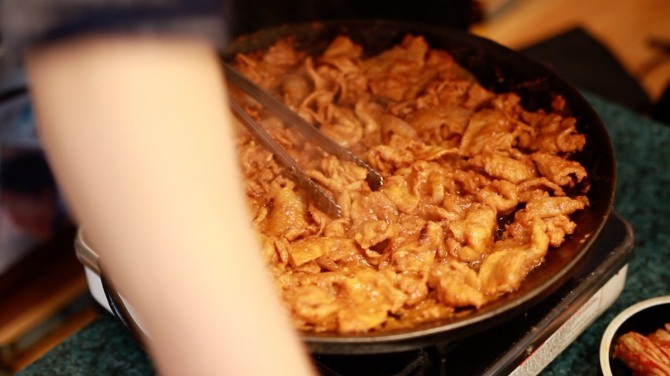 Yoojung Sikdang doesn’t provide a fine dining experience, but if you love both BTS and affordable and authentic Korean food, the restaurant should probably be on your list.